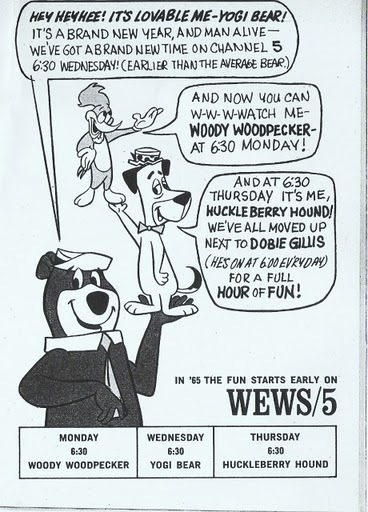 All You Ever Wanted to know about early Hanna-Barbera Cartoons..By Yowp..
"Yowp" character appearance in Yogi Bear Cartoon Duck In Luck (1959) courtesy Don M. Yowp..
May 1965 ad in TV Guide for TV 5 Cartoons..Huckleberry Hound, Yogi Bear and Woody Woodpecker.. I just wanted to alert everyone to a new link.. I've mentioned before about watching Captain Penny in the mid 1960's on WEWS-TV 5 weekday afternoons..At first Ron Penfound as the Captain featured the Little Rascals and the Three Stooges..Later he had Rocky and Friends, King Leonardo, Mr. Magoo, King Features (Beetle Bailey, etc) and others..still later he featured Roger Ramjet and Batfink, as well as newer Terrytoons.. 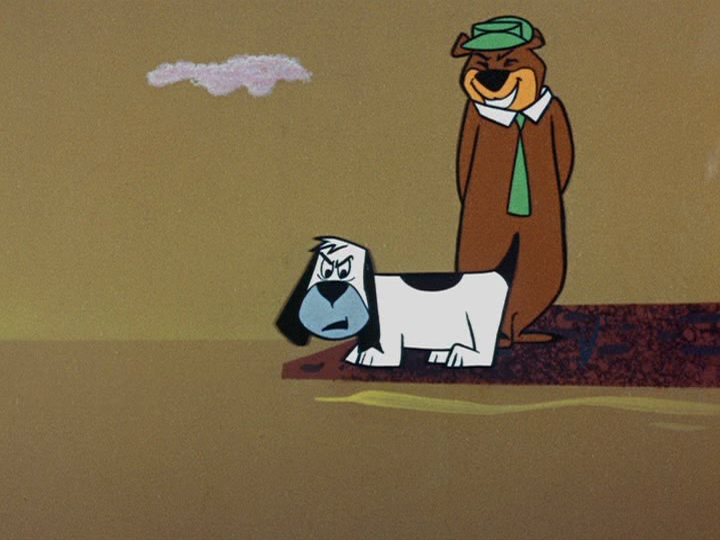 I liked them all, but my favorites were the Hanna-Barbera Cartoons..Captain Penny had Magilla Gorilla and Peter Potamus on the show. Saying all that, I want to introduce a friend's blog..while it isnt new, I've enjoyed reading it from time to time over the last couple years..A Vancouver, Canada native, known as "Yowp" on his blog and "Don M. Yowp" on Facebook has been a huge early Hanna-Barbera fan, especially the years from 1958-64..His blog, "Stuff About Early Hanna-Barbera Cartoons" features analysis on specific cartoons, ads, newspaper articles and other memorabilia about Hanna-Barbera and their Cartoons..By the way, "Yowp" refers a dog character that tries to catch a duck in a Yogi Bear Cartoon and in a monotone voice goes Yowp..Yowp Yowp..
Recreation of a WEWS Promo for the Quick Draw McGraw Show-The audio is a live promo for Quick Draw McGraw dated Friday May 24, 1963 done by Ron Penfound at about 12 Noon that day..
MeTV Logo..Putting a zip code in the MeTV database generates a City/Market-specific page for the website..
MeTV has a great blend of all kinds of Classic TV shows from the 50's to the 80's..With shows like Marshall Dillon, Dobie Gillis, Petticoat Junction, My Three Sons The Beverly Hillbillies, Cannon, Hawaii-Five-O and many more.. Weekends feature Rich Koz as "Svengoolie" a horror host in the vein of Ghoulardi, the Ghoul, etc..Svengoolie was first played by Jerry G. Bishop, who originated the character in Chicago on WFLD-TV 32 in 1970..From what I've seen, Bishop borrowed heavily from the "Ghoulardi" Persona which he was aware of from his days in Cleveland at KYW..
Just a note that MeTV is having a 100th Birthday Lucille Ball Marathon August 5-8, so regular programming will be pre empted.. 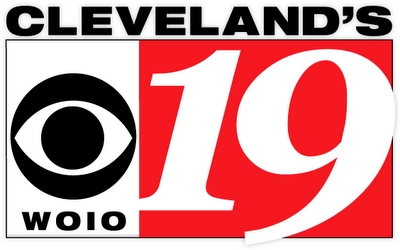 Here's where Classic TV can be found in Cleveland/NE Ohio.. 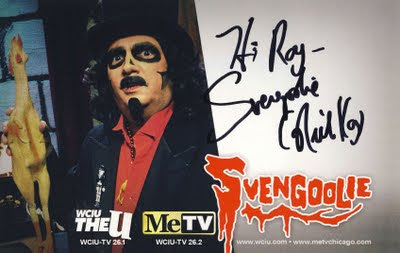 I'd say we in this area are quite fortunate to have so many great choices in classic tv..